For those relatively new to wine enjoyment, you are likely to be confronted with the issue of how to reliably find good wines – that is, wines that you like. Is it a matter of price? Is it about where the wine is from, or the varietal? I drink wine nearly every day. I drink mostly at home, but have a glass or a bottle in a restaurant one or two times per week. I enjoy wine, but I want to get a good value almost all of the time; the possible exception being a very special occasion, when I may splurge on a more expensive bottle. I don’t want the desire for a good value to keep me from getting wines that I like either, so I try to find a balance. I like many kinds of wines, and drink reds, whites, rosés, as well as ports and dessert wines (although the last two much less often). I like to pair wines with food, but am not overly strict about it. I pay attention to the heaviness or lightness of the wine – say an Oregon Pinot Noir (light) versus a Paso Robles Cabernet Sauvignon (heavier). I would likely have the Pinot with salmon or a lighter chicken dish and the Cab with a steak or pork loin. So the main wine factors are heaviness and lightness, spiciness or minerality vs. fruit-forward, acidity, and temperature (chilled vs. room temperature). Other factors are season and temperature (colder = heavier and unchilled; warmer = lighter and chilled). These are not hard and fast rules – I have Cabernet Sauvignon in the summer and Sauvignon Blanc in the winter (I live in Southern California, so winter is a relative term for me). I prefer wines with some unique or distinctive qualities, even at lower price points. This means, that I tend to stay away from cheap, mass-produced wines. These wines are almost always made to be drinkable to a wide variety of people, so they are usually fruity, bland, and forgettable. Another factor is price. Think everyday wines vs. that special night wines vs. really special occasion wines. If you averaged out the cost per bottle of the wines I drink in the average week, it would probably land somewhere between $13 and $15. My go-to summer white this year is Portes de Bordeaux, a $6 French white from Trader Joe’s (which they will not likely have again next year). Our favorite rosé is by Chateau Nages, a Provençal wine that sells for $9.99 at Total Wines and Spirits (see earlier posts on Go-To Whites and Rosés for Summer. These and similar wines make up at least two thirds of our consumption. The other third is a mixture of more special wines, a Sancerre for $25 or a California Syrah for $28 that we have purchased either during our travels, at a winery, at local wine shops, or on-line. We purchased a case of Bordeaux wines on a trip last year and some of those are ready to drink, so we have had a couple bottles from that case (which would skew our average price up quite a bit). To buy good wine (defined as wine that you like) on a budget, you have to know what you like. After that, it is a matter of learning what wines fit into that category. Ask the people who work at a local wine shop or two what wines are similar to what you like. For example, if you like Malbec, you will probably like Barbara; if you like Chenin Blanc, you will probably like Pinot Gris. 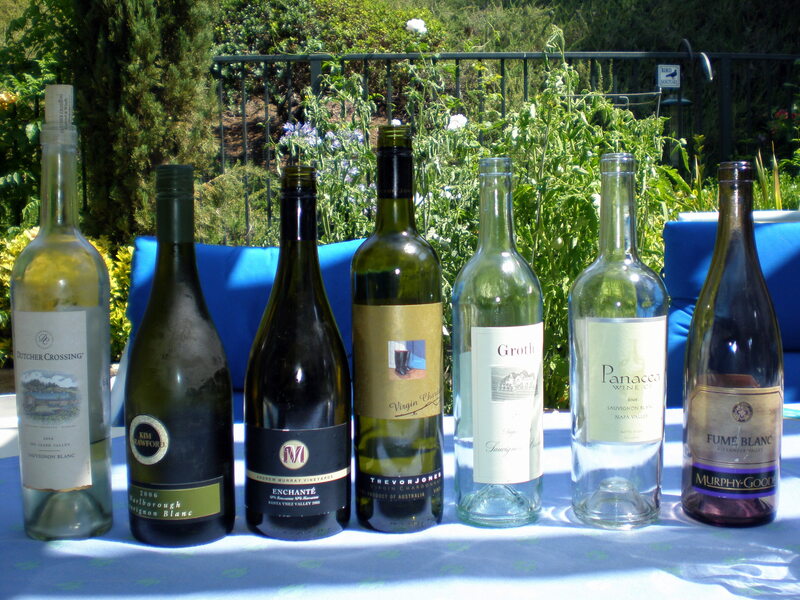 Get six or eight bottles of wines that are similar and try them out. Then re-purchase the ones you really enjoy. When you find those everyday wines that you really like, consider stocking up – get a case or two. If you are interested in aging wine or buying as an investment, you have a different set of standards. I will write about those in a future post. I wish we had a Trader Joe’s here in Fort Lauderdale. We used to buy bottles of Two Buck Chuck there and truly enjoyed it! !